Lakeland, Florida new car shoppers are invited to visit our new and used dealership to explore the innovative 2018 Kia Forte that is now available! Here at Regal Kia, we customize vehicle shopping plans to ensure the needs of our customers are being met, so if it's time to trade up, it's time to reach out to our Kia sales department! Our staff is not only familiar with all the 2018 Kia Forte trim models that are for sale but the amenities each comes with, like a Rear Camera Display, unique styling features and power sunroof. Ready to explore trims? Shop our Regal Kia Forte inventory online from your nearby Wesley Chapel, FL home now! Secure a vehicle that not only ensures you stay connected to the road but connected no matter where the road takes you, buy or lease a 2018 Kia Forte with help from our dealership in Lakeland, FL. With assistance from the available UVO connectivity system, drivers can make hands-free calls, send locations to their Forte or can even manage music, all while staying focused on what's ahead. This 2018 model also boats Kia Drive Wise technologies which include features like Autonomous Emergency Braking, a Lane Keep Assist System, Forward Collision Warning System and Lane Departure Warning System. Looking for even more technologies? Check out the Forte's Rear Cross Traffic Alert and Blind Spot Detection system! From its available leather seat trim to its dual-zone automatic temperature control and ventilated front seats, the 2018 Kia Forte is built for comfortable all-day cruising. 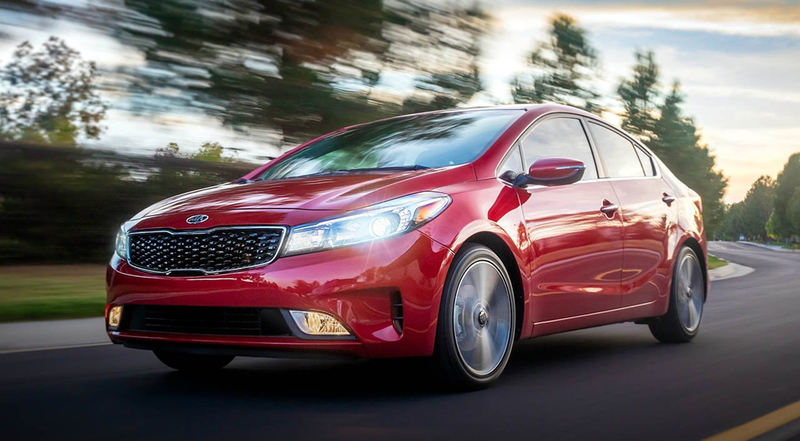 The sales department here at our Kia dealership near Winter Haven, Florida is familiar with all the trim models that are included in the 2018 Forte lineup and will happily review the comfort features of each so that you can secure the one that complements your wants, needs and personality. Step up your driving game while enjoying the road like never before, find a 2018 Forte at Regal Kia today! Car shoppers that are looking for new 2018 cars for sale near Wesley Chapel, FL that boast an advanced airbag system, height-adjustable seat belt anchors and Lower Anchors and Tethers for Children are invited to our auto dealer in Lakeland to learn more about the 2018 Kia Forte. The Forte is there when you need it most, as it features active safety systems that can assist in the unlikely event of a collision. Interested in learning more about the Forte's Traction Control System, Vehicle Stability Management, Anti-Lock Braking System, and Tire-Pressure Monitoring System? Contact Regal Kia now! Cruise around nearby Brandon, Florida behind the wheel of a sleek vehicle that boasts a signature tiger-nose grille, available 17-inch alloy wheels and chrome exhaust accents, finance a 2018 Kia Forte from our new and used dealership. Our team will go over all the stylistic elements the Forte has to offer and can review our comprehensive Kia financing services so that you can drive home in a 2018 model tonight. View the stylish lineup now after submitting a credit application to our team!